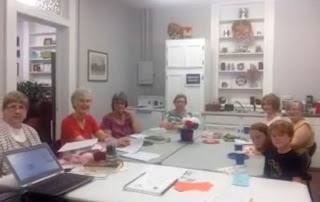 Pictured left to right in the group above are the Yarn Spinners and their guests: Jan Ballard, Frances Coleman, Becky Williams, Sharon Kennedy, Ellen Turnipseed, Ginger Rose, Eva Turnipseed, and Alex Turnipseed. Not shown is Juli Hughes (member and event photographer). I sincerely appreciated the club's invitation and wish I could have visited in person, but I guess a live video discussion was the next best thing to being there. 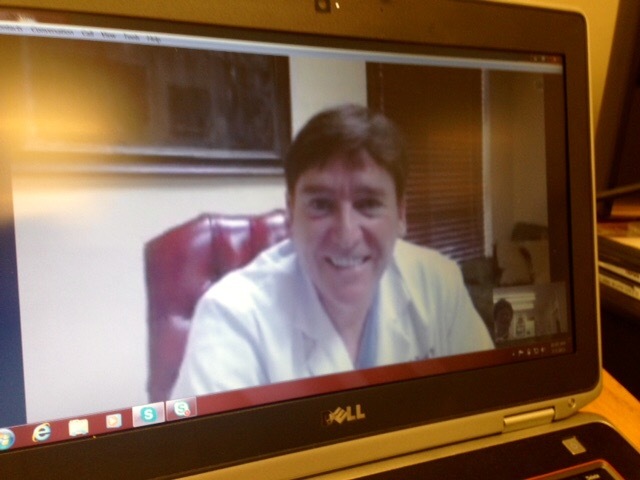 Many thanks to Juli Hughes for coordinating the video teleconference. The Yarn Spinners is a welcoming group of intelligent, progressive readers. I hope this wonderful book club reads my next book and asks me back! Yes, I too have had this enjoyable experience. The mystery bookclub at the Laredo Public Library invited me to visit them one day via Skype. I couldn't see them, so had no idea I was up on the big screen before them as we chatted away for over an hour. I was totally not self-conscious! ha. They had prepared several questions about the book itself, and also about the writing experience. It was flattering on the one hand, and it also was so fun to have the characters come to life in the room with the readers as we talked about them. Thank you for sharing your experience, Sandra, and for adding to the discussion. I hope to have the opportunity to participate in more video conference book clubs as an author.